Rubbermaid Tackle Boxes are no longer being manufactured. So, you're not going to find a brand new tackle box by Rubbermaid at any distributor online or offline. But if you're lucky enough you can find people selling their old used ones. Scroll down towards the middle of the page where the headline reads Looking For Rubbermaid Fishing Tackle Boxes. Or continue reading to learn a little more about the company with a brief history lesson. Rubbermaid first began producing tackle boxes in the 1990's. They filed for two patents on June 28, 1993. 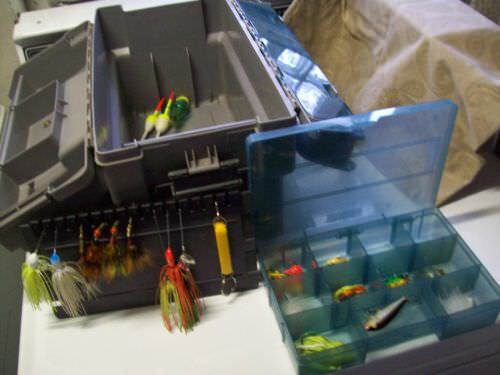 One patent was for a regular tackle box, which was issued on August 25, 1995. The other patent design was a front access tackle box, which was issued on September 5, 1995. Of course they designed other fishing tackle solutions, but these were the first two that they started producing for fishermen. They were one of the first companies to create a hard sided fishing tackle box with removable stowaway tackle box trays. 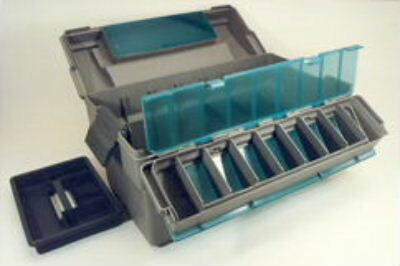 Now it seems that every other tackle box company is producing their own stowaway trays. I can't walk into an outdoors store or bait and tackle shop without seeing these everywhere. Rubbermaid created two versions for the stowaway tackle box. One was designed to hold 3 stowaway trays, and the other was designed for 7 trays. This was a great option to have which is why the offered it. You could go big if you wanted to carry a lot of gear, or small and compact if you only needed to take a few essential things with yourself. It's too bad that Rubbermaid is no longer in the fishing tackle box industry. Perhaps the competition was just too fierce. None the less, they are very great at what they do... producing quality and durable storage solutions for a variety of our organizational needs. They are about the best in the business. If you're looking to buy a tackle box made by Rubbermaid, well, you're going to have to do some hard looking. These don't seem to be easy to find. I don't know how many of them are out there, but it can take some time and patience to find one. People have them, but it doesn't seem like they are letting them go. My guess is that they either collect them and/or don't want to let them go, or they have them packed away somewhere, or just don't know that they still have them. You can try your luck at garage sells. Or maybe put the word out that you're looking for Rubbermaid tackle boxes. In the meantime, you can check on Ebay. Every now and then I'll see one or two listed for sell on Ebay. Since you're here now, why not Bookmark this page and Subscribe to the RSS blog feed so that you could be reminded to check back every once in a while. ﻿. Every now and then I'll see one or two listed for sell on Ebay. Since you're here now, why not Bookmark this page and Subscribe to the RSS blog feed so that you could be reminded to check back every once in a while.